For the past month, on top of working on the Foggy Frog and the Pain Gang Kickstarter campaign, I’ve been working with an Exercise Physiologist. The goal of working with the exercise physiologist is to work out what exercise program I can maintain that will over time improve my physical health. Today I’m going to provide a brief overview of these three areas and provide my current exercise plan as an example of what can be done. It is important to remember that everyone is at different levels of health and what works for me may not be right for you, so before you decide to try something new please check with your doctor or health care professional! Especially given that most of us are suffering from various illnesses that do affect our ability to do what ‘normal’ healthy people can do. Strength (or resistance) training is an important part of maintaining overall health. This form of training focuses on maintaining and/or building muscle which is important as it helps protect your joints from injury, improves your mobility, and can be beneficial in managing pain and improving your overall sense of wellbeing. When beginning a strength training program it is important to understand where you are starting from and not to push too hard to begin with. For example, people who are currently bed bound may begin with gentle range of motion movements and may actually need someone else to help move their body. While someone who is healthy and fit may be lifting extremely heavy weights to build and maintain their big muscles in their legs, back and arms. Remember to start from your current position. For me, this meant starting with some basic body weight exercises. I am not bed ridden but it has been at least a year since I’ve done any heavy lifting or weights programs. What do I mean by basic body weight exercises? When I first went to see the exercise physiologist at the beginning of March I was prescribed 4 exercises to do. These exercises focused on the main muscle groups (the quads, glutes, and shoulder and arm muscles). Sit on the edge of a chair, feet flat on the floor. Stand upright, extending knees fully and engaging glutes. Should feel this exercise working your leg muscles. Start with a surface that is high, as this will be easier. With arms slightly wider than shoulder width apart, and feet at a comfortable distance from a wall, gently lean body towards the wall. 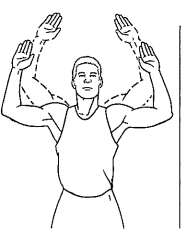 Relax shoulders, and avoid chin moving towards the wall. Push back out to original position, making sure not to lock elbows. Lying on your back with your knees bent, bring your belly button towards your spine to keep your core activated. Slowly raise your bottom from the floor. Should feel this working your glutes. **I was originally asked to do these standing against a wall, but my neck and shoulder muscles are so tight that I struggled to do the exercises. It has been modified so I now do them lying on the ground with knees bent. 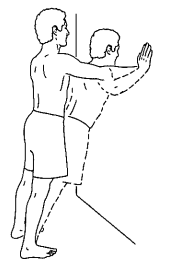 Stand against a wall (with spine neutral)**, raising your arms to a comfortable height with your elbows bent to 90º. Gently squeeze should blades together and down (arms will move down the wall). Only go to a pain free range of motion. For the first week I was only to do one set of 5 repetitions for each exercises twice that week. If I didn’t have more pain/less energy/crashes from doing that I was to up it to 2 sets of the 5 repetitions for each exercise twice a week. After doing this for 3 weeks, I have now been told I can add an extra day. So I will be doing 2 sets of 5 repetitions three times a week (Monday, Wednesday and Friday). With the modified arm slide, I hold the initial “arms up with elbows bent” position for 10 seconds before doing my 5 repetitions. This is to help stretch the necessary muscles to make it possible for me to do the exercise against a wall in the future. Cardio exercise is important to protect against cardiovascular disease. The exercises we do make sure our heart muscle is working hard and our blood is pumping around our body. As with the strength exercises it’s important to know where you are at and start at a point that is not going to cause crashes. For one person this may be getting out of bed and walking to the bathroom, for another it might be running 12kms. There are many different forms of cardio exercise but for those of us with chronic illnesses the best ones to try are walking, riding a bike, or swimming. These activities are low intensity and are less likely to damage our joints. This is important because we are likely to have less muscle protecting them. Before seeing the exercise physiologist I had been trying to increase my cardio with a form of graded exercise therapy where I was increasing my exercise each week by 10%. I was walking or riding my bike daily (mainly walking), and occasionally going swimming. I had built my walks up to 30 minutes BUT was needing to rest for about 2 hours after each walk. The exercise physiologist suggested cutting my walks back to 20 minutes maximum which seems to have helped with the length of rest I need after each session. At the moment I’m not riding my bike and only very very occasionally going swimming because I want to focus on my walking and trying to increase back to 30 minutes slowly over time, with the exercise physiologists supervision. I aim for a 20 minute walk daily unless I have a day of appointments (where I walk a lot between them) or I’m participating in an outing or activity that will involve a reasonable amount of walking, riding or swimming. Maintaining flexibility is extremely important for those of us who suffer from chronic pain conditions. Keeping the muscles moving and stretching them can be extremely beneficial for pain management. The most basic form of flexibility exercises are stretches. Again, if bed ridden you may have someone else move your body and stretch it for you. A more advanced form of increasing flexibility is to participate in yoga, pilates or tai chi. These exercises work on stretching and strengthening your muscles in a gentle way and also provide mental health benefits from the meditation like format of sessions. Very early on in this illness (after the first few months of complete crash) I began to introduce exercise into my life in the form of yoga. I started with just gentle stretches and moved slowly into more yoga poses. At this stage I’m up to about 12 minutes of yoga a day. I do this either as a single session in the morning or as a series of stretching sessions throughout the day. On the days I do my strength exercises I do them as a circuit with my yoga poses in between to stretch the muscles that I’m using. I’ve found that this helps reduce the number and length of rests I need during the exercise program. So that provides a basic overview of the 3 areas of physical health and provides a few examples of how someone with a chronic illness (i.e. me) has found a program that works for them. 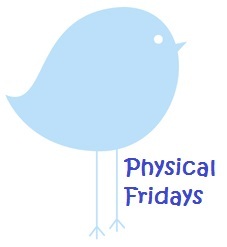 What helps you most in maintaining your health through physical movement?